Just in time for next year's Valentine's Day :) (I missed this year by a couple of days) I finished my love bird inspired apron to add to the celebration. 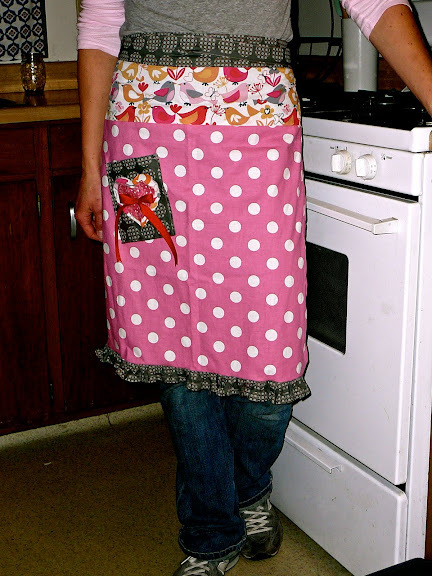 It is just the cafe apron with an added coordinating fabric on the top. I think this is one of my favorites so far. The length is adorable, more so than the typical cafe apron length. I love the hearts on the pocket with unfinished edges, the homemade ruffle, and especially the red bow. The different thing from this cafe apron to others is that the top band/ties are all one piece. It encases the top edge of the body of the apron and is sewn around all sides, sealing also the ties. So sorry Mel, I don't have a pattern for it, but I used this apron (and a link in that article) to make the base and then embellished how I wanted. Hope you make some fun ones!